B-2 visas are issued to people coming to the U.S. to visit friends or relatives, to vacation or to accompany a B-1 visa holder. In most cases, the American Consulate will require evidence of the nature of the trip, as well as proof that the applicant intends to return to the home country. Sometimes an invitation from a friend or relative in the U.S., proof of residence and employment abroad, and other evidence of permanent ties outside the U.S. can help to establish the "intention to return". The applicant should also provide a round-trip airline ticket, and proof that he or she has enough money available for the duration of the trip, such as bank statements or credit cards. The B-2 visa can be issued for multiple trips. Upon entry to the U.S., the alien is generally admitted for six months. Medical diagnosis from a local physician, explaining the nature of the ailment and the reason the applicant requires treatment in the United States. Letter from a physician or medical facility in the United States, expressing a willingness to treat this specific ailment and detailing the proposed medical treatment as well as the projected length and cost of treatment (including doctors’ fees, hospitalization fees, and all medical-related expenses). Statement of financial responsibility from the individuals or organization which will pay for the patient’s transportation, medical and living expenses. The individuals guaranteeing payment of these expenses must provide proof of ability to do so, often in the form of bank or other statements of income/savings or certified copies of income tax returns. B-2 visas may also be issued to those persons who intend to be bona fide students in the United States but have not yet selected a school. 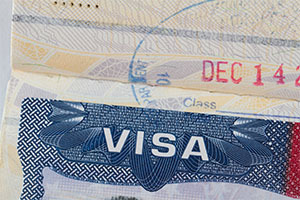 The Consular Officer must be informed of the prospective student’s intent and will mark the visa with the notation: “Prospective Student; school not yet selected.” Once the student enters the United States and is accepted into a school, he or she can then make an application to change status. However the student cannot start classes until the application for change of status has been approved. If a visitor can show a good reason for needing to stay in the U.S. beyond the initial six months, the alien can apply for a six month extension. For more information, please contact a New Jersey travel visa lawyer at LS&P Lawyers.